Webcam "Weather Webcam Beatenberg (Bernese Oberland, Thunersee)"
In Beatenberg, there is the Webcam Weather Beatenberg (Bernese Oberland, Thunersee) with motif: Tourismus Webcam by sietec.ch. The webcam Beatenberg is regularly updated with new pictures. 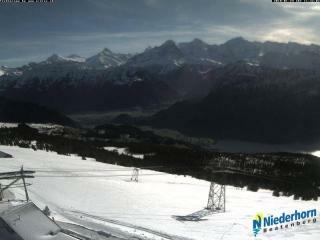 Track the current weather in Beatenberg Bernese Oberland with the webcam BEATENBERG. The low-Horn is a 1963 meters high and is located in the Bernese Oberland. The low-Horn is the mountain of Beatenberg. It is located above Lake Thun. At about 1700 meters, the nature reserve Seefeld is located with the karst area of seven stallions. The current live Weather for Beatenberg is provided by netatmo.